Manufacturer of a wide range of products which include pressure drop in two- phase flow equipment, michell tilting pad bearing apparatus, drag co-efficient apparatus, hydrodynamics of packed bed liquid hold-up apparatus and flow through fluidized bed apparatus. 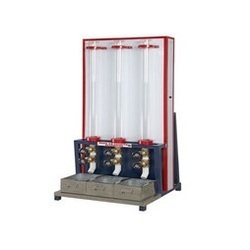 We are offering a wide range of Pressure Drop In Two- Phase Flow Equipment. 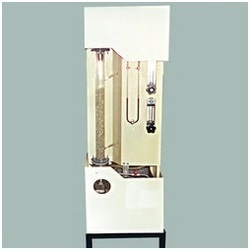 The Apparatus is designed to study the pressure drop in two-phase flow under different patterns. The set-up consists of a test section, made of Borosilicate Glass to visualize the different patterns. A Centrifugal Pump, with flow control valve and by-pass valve, is provided to supply water to the pipe line. At the outlet, a Separator is provided to separate the air from water. Two Rotameters one each for Air and Water are provided to measure the flow rates. We offer high quality Michell Tilting Pad Bearing Apparatus to our esteemed customers. The offered apparatus is commonly used for the purpose of demonstrating the pressure distribution that occurs in pad bearing. 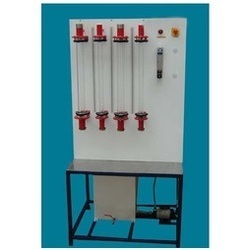 Owing to easy the installation and flawless design, this offered apparatus is highly demanded in the market. 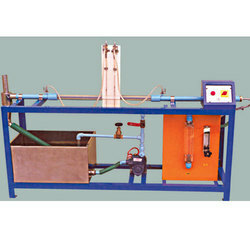 We offer optimum quality Drag Co-Efficient Apparatus to our valuable customers. Manufactured in compliance with the industry set standards, the apparatus is commonly used for studying the behavior of particle-fluid systems. This apparatus is highly demanded in the market for its impeccable finish and optimum performance. We are offering a wide range of Hydrodynamics of Packed Bed (Liquid Hold-Up). The set up is capable of studying the loading and flooding characteristics. It is a packed column packed with Rasching Rings where the Air is counter currently fed to the column. The liquid holdup in the column increases the weight of column and also reduces the effective porosity of packing. This reduction in porosity decreases the gas velocity, increases the pressure drop and changes the value of mass transfer coefficient. The setup consists of a glass column with fluidizing material i.e. beads, S.S. mesh to support the beads and with the calming section. A pressure drop across fluidization can be measured by a manometer. The setup studies in fluidization characteristics and relationship between the velocity of the fluid and pressure drop per unit length. The apparatus is close circuit type provided with the suitable capacity tank, FHP pump, necessary pipeline valves and a Rotameter to measure the flow rate of the fluid. The setup is fitted on an MS frame painted with good quality paint. 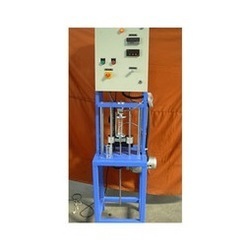 Looking for Momentum Transfer Lab Equipments ?